Jesus never told his disciples that this life would be easy if only we would follow Him. In fact, He said just the opposite. “In this world, you will have trouble,” he told his friends, as is recorded in John 16:33. “But take heart, I have overcome the world. ” Our peace does not come from our situation, thank God. If it did, we would be on one crazy roller coaster of emotions each day. I have faced more sadness than I have felt I can bear during the past year-and-a-half. Two beloved members of my family are critically ill, fighting for their lives. I’ve had days where I could barely force myself to get out of bed and go to work. After the months and months of tears, I’m crying happy tears today because our daughter and son-in-law have been matched with a birth mom, and we are going to have a newborn baby girl join our family around Christmas time! The emotional highs and lows of daily life are dizzying! Praise God, he is never changing, because everything else around us ALWAYS is! But our peace, our rootedness, comes from knowing that Jesus has overcome the troubles in this life, and that God, our Father who loves us without end, rejoices over us. Let me say it again, HE never changes. We fall, we get dirty, we wallow in fear and self-pity, we sin, we doubt, we lose faith, we get back up and try again, sometimes only to fall again, and yet God does not tell us this is the last time He will help us. Zephaniah 3:17 tells us, “The Lord your God is with you, the Mighty Warrior who saves. He will take great delight in you, in His love, He will no longer rebuke you, but will rejoice over you with singing.” Can you imagine what the voice of the Lord singing must sound like? Go ahead, take a moment and meditate on that. Let that thought fill your mind and heart. What would it sound like to hear God singing? We know his voice is powerful, like the sound of mighty waters (Rev 14:2), and we know that he whispers (1 Kings 19:12), but what does his singing sound like? Here’s a theory…. Our home is surrounded by trees, and in the spring and summer, I have beautiful shade gardens full of birds. On days when my heart is sad, and sometimes when it is bursting with joy, I take my guitar outside and do what I love to do most, sing. Sometimes when I sing, little birds come and sing near me, on branches right above me! I’ve wondered, is that little bird bringing the voice of the Lord to sing over me? I don’t really have a scriptural answer for that. We are told in Psalms 66:4, “All the earth worships You and sings praises to You. They sing praise to Your name.” Wow! ALL the earth is singing praise to God! But does he use those little creatures to bless us straight from his throne? I think he does. He sent the ravens to feed Elijah. I think it is entirely possible that he sends the birds to rejoice over us with his song. What burdens are you carrying today, friend? 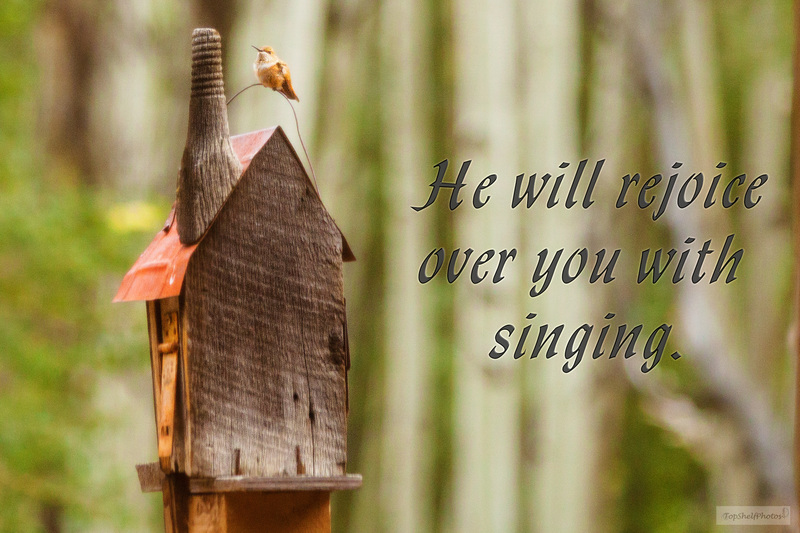 Let God rejoice over you with singing. Listen for his voice telling you how much he loves you. Be at peace, knowing that Jesus has overcome this world with all of its hardships and trials, and your Father, the Mighty Warrior who literally slays the dragon, sings over you with rejoicing. I would love to hear from you about what you would like prayer for, or how you know in your heart when the Lord sings over you. Feel free to leave your comments below!